The Korean War stands as a key event in world history. It was the first shooting confrontation of the Cold War, and it was the first limited war of the nuclear age. It remains the only time since the Second World War that two of the world's major military powers - in this case the United States and China - openly fought one another, with diplomatic miscalculation and ineptitude on both sides leading to fierce combat. The Korean War was also the United Nations' first opportunity to play a leading role in world military events. 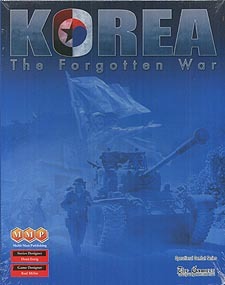 Korea: The Forgotten War covers the first year of fighting and highlights the mobile phase of the war using the award-winning Operational Combat Series (OCS) rules. The full flavour of the mobile campaigns is brought to light, as are the political influences and constraints on the parties. Scenarios are included for players wanting to explore specific operations. They can also be used as training exercises before taking on one of the long campaign games. Options include variations on the Red Chinese entry into the war, nuclear weapons, and full Soviet support in addition to a number of more minor variations. 13 scenarios of which 2 use 2 maps, and 5 use 1 only map. This is a reprint of the 2003 game. Some corrections have been made, including some to make this compatible with the latest version of the series rules (v4.1a). 2 Korea: The Forgotten War charts and tables.